Welcome back! Last week, I successfully defeated the Vogons, retrieved the elusive babel fish, and managed to secure an atomic vector plotter before being jettisoned out of an airlock. Not bad for a Thursday! This week, I will be picking up the thread just after passing out for lack of oxygen and very improbably being picked up by a passing spaceship: the Heart of Gold. 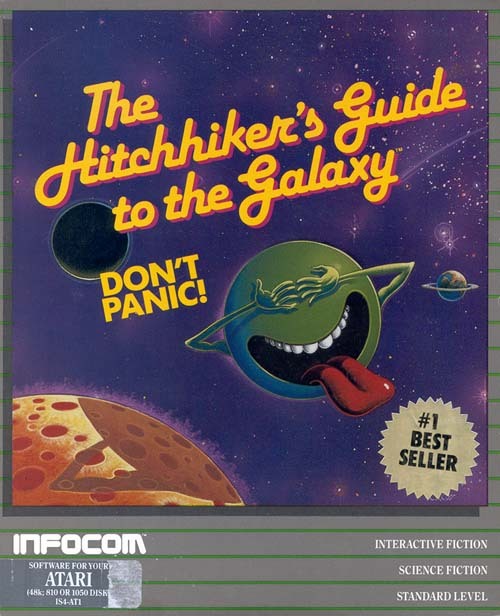 Thus far, the Hitchhiker’s Guide game has been a lot of fun, if a bit linear. Contrary to my initial fears, Adams and Meretzky have managed to make the game funny without being inscrutable; there is a logic to the puzzles that makes them solvable and gives you a sense of pride for doing so. I mentioned last week that I am stuck and I remain so, although I have some new things to try. I have decided to pause my own playing for another week or so until the writing catches up. I hope that my re-playing the events will inspire me to find the thing I missed. 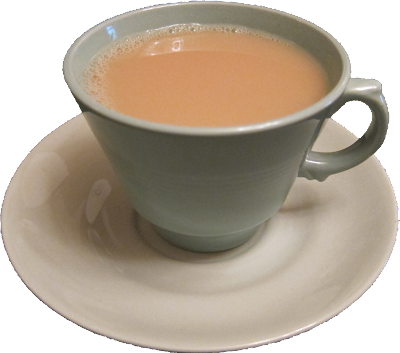 I think I realized something that I missed even while typing out this post, so I look forward to experimenting. Onward to the adventure! When we last left Alexander, he was about to crash a wedding TWICE! But before continuing the game, something has been bothering me about the events that preceded the start of the game. The people of the Land of the Green Isles have told me that the old King and Queen had died of grief after Cassima went missing. But when I met the royal couple's ghosts in the Land of the Dead they informed me that Alhazred had killed them with a dagger while they slept. Gruff: Captain Saladin. The King and Queen are dead – they have dagger-shaped wounds in their backs and there is blood all around the Royal Bedroom. Saladin: Dagger-shaped wounds in their backs, eh. Hmmmm. I was a little lost last time, but progress has been made! I decided to leave the statue and the book where they are in the darkness, having no space to take them, and turned the corner towards the gallery. Jeremy Hartwood was a painter of some talent, and had a gallery made in his house to display those pieces that presumably meant something to him, or maybe just couldn’t be sold. Missed Classic: Hitchhiker’s Guide - I Got the Babelfish! 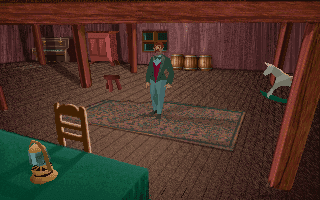 What is the most famous puzzle in adventure game history? Is it defeating the snake in Colossal Cave? 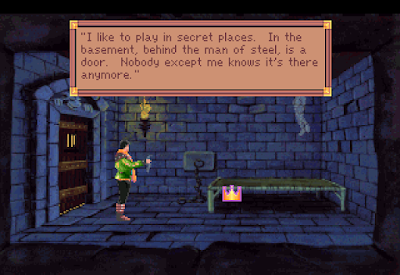 Sneaking in the back of the white house in Zork? 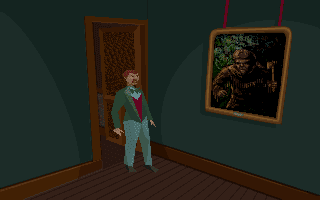 How about something from King’s Quest or Maniac Mansion? In 1984, one of the most famous puzzles (at least according to the marketing department at Infocom) was the babel fish from Hitchhiker’s Guide to the Galaxy. 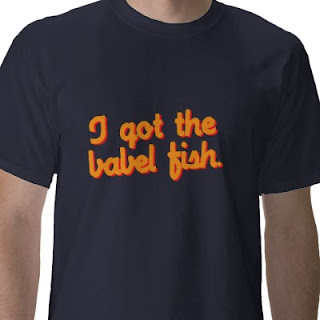 The puzzle was so famous that successful players purchased a now-prized t-shirt advertising that fact: “I got the babel fish.” If I had lived in 1984 and played this game, I would definitely have bought the shirt. Why? Because, this week I got the babel fish. 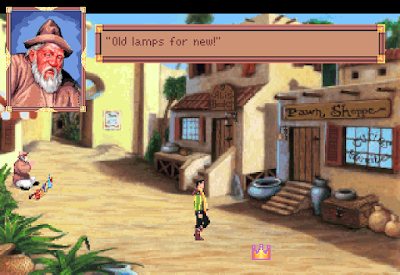 I confess that this puzzle probably isn’t that famous considering that I do not remember it from my original playthrough of this game more than twenty years ago, but it was still fun. I’ve received t-shirts for dumber reasons. Before we begin today, I recommend setting the mood in with “Journey of the Sorcerer”, the theme song to the original series. In a burst of cosmic similarity, I’m going to cover in this post roughly the same ground as the first episode of the radio and television series. I doubt I’ll be able to keep that up as the game will diverge from the source material, but it’s as good as any place to begin. 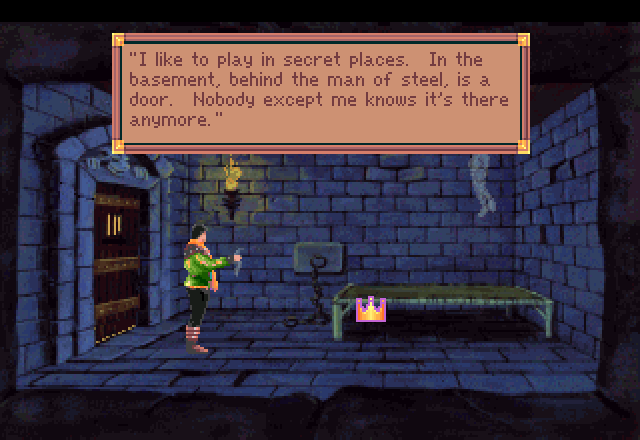 Now that I've used both methods to enter the castle, let's see how I fared in each case. The castle's puzzles are also different on the two potential paths, so let's split them up and see where we end up. Let's start with the Land of the Dead playthrough. When we left off after Alexander entered the castle by his magic painted door, he was perusing his options. 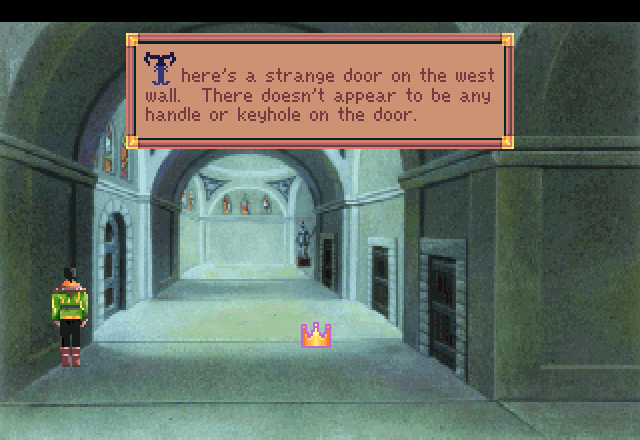 The first door to the right appears to be the dungeon I get thrown in whenever the guards capture me, so nothing special in there. The second door is a similar dungeon, but this one contains a ghost. The ghost is a small boy crying for his mother. I assume it's Ali and give him the handkerchief his ghost mother gave me in the Land of the Dead. Before he joins her, I ask him if there's anything he can do to help me, as Alexander doesn't work for free. So, a door behind Superman. Got it – thanks, kid. To my right, a suspicious suit of armour, holding a very sharp sword. Ahead, a pair of locked doors that closed as I arrived on this floor. So I choose to go to my left, towards the unknown. This direction leads me to a corridor and some stairs down. This would be a bit more complex and require a bit of exploration before I’d even know where to go and what to do. The corridor’s first room was a small bedroom, with little of note except a notebook. This was the diary of Jeremy Hartwood’s final days in this house. A troubled artist, he had delved into the darkness that consumes this house and fell foul of its corrupting touch. In a series of dreams, he found stone pillars in a dark desert, a strange man whose look froze him dead with fear, and a sacrificial knife used for human sacrifice. 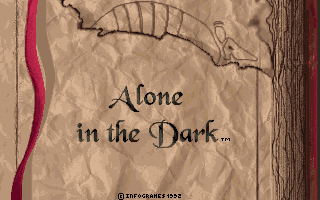 Infocom may have been the masters of text adventures, but they aspired to more. 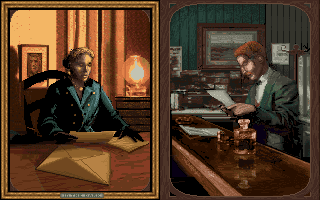 They wanted to be “interactive fiction”, to have the recognition that gaming could be an art form on the same level of a good book. To this end, they pursued authors, most notably up to this point Mike Berlyn (Suspended, Infidel, and Cutthroats) and Jim Lawrence (Seastalker). Even Steve Meretzky, Infocom’s jack-of-all-trades was now a published author. But could they have scored a greater prize in 1984 than Douglas Adams, already admired as one of the all-time greats (and all time weirdest) writers of witty and absurd adventures? Mr. Adams had written and performed with Monty Python. He had produced some of the greatest episodes of Doctor Who to date. He had found seemingly overnight success with his Hitchhiker’s Guide series on radio, albums, television, and books. Now he was coming to work with Infocom to adapt his most famous work to gaming. It would be a tremendous challenge, but if they succeeded it could change the face of Infocom and gaming forever… or at least until someone decided to bet the farm on business productivity software. This week, we’ll tell his story and start the game that he produced. Can Mr. Adams’s style of humor translate to a good game? Is it even possible to make a good game based on a comedy? I am very eager to find out. This is a game that wants to kill the player character, and it begins from the start, even as you’re just getting used to your surroundings and used to the controls and user interface. I try to get my bearings in the attic, this large open space that is not nearly as full of clutter as you might expect. The game uses what are generally referred to as “tank” controls using the arrow keys on the keyboard. Up to move forwards, down to move backwards and the left and right keys to turn slowly in either direction. 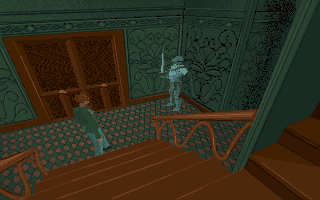 When we left off last time, Alexander had just entered the castle using Beauty's serving maid clothes and had gotten himself captured by attempting to enter the most obvious door. Now, I played on for a little while and became stuck due to a dead-end that required me to reload to before entering the castle. I did reload, and did some extra exploring, and ended up finding the other way to enter the castle that the Oracle, Laukku and Michael had told me existed. So let’s ignore my fruitless efforts in the castle for now, and deal with me finding a more circuitous route to the castle. When I went back to town to swap my paintbrush for a nightingale (not having a nightingale was the dead-end I found in the castle) I saw a guy I hadn’t seen for quite a while. You may look like a homeless Santa Claus with a paper boat for a hat, but I've missed you, man.